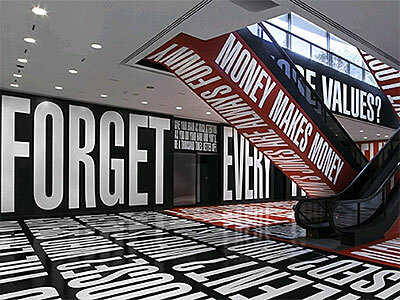 This site-specific installation by Barbara Kruger (American, b. Newark, NJ, 1945) wraps the entire lower-level lobby in text-printed white vinyl against fields of black and red. Covering the walls, floor, and escalator sides, this immersive piece explores themes of democracy, doubt, and belief. The resulting environment is a visually spectacular hall of voices that envelops visitors as they descend from the ground level. Reading becomes a whole-body experience, with phrases revealing themselves only as the spectator circulates through the space.